application: WB. dilution: 1 : 1000, sample: nuclear extracts from unstimulated and 12-O-tetradecanoylphorbol-13-acetate (TPA) stimulated HELA cells. 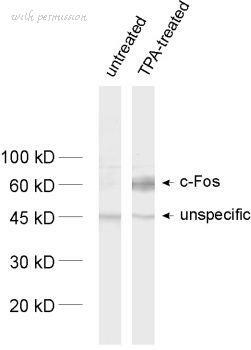 The c-FOS antibody from Proteintech is a rabbit polyclonal antibody to a fusion protein of human c-FOS. This antibody recognizes human, mouse antigen. 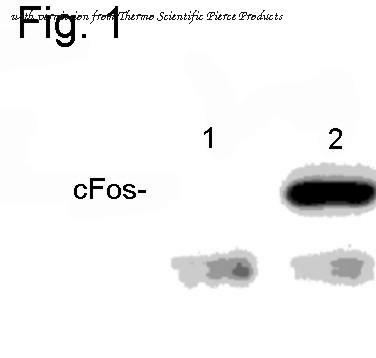 The c-FOS antibody has been validated for the following applications: ELISA, WB analysis. Immunofluorescent analysis of c-FOS (green) in untreated HeLa cells. Formalin fixed cells were permeabilized with 0.1% Triton X-100 in TBS for 15 minutes at room temperature. Cells were then blocked with 5% normal goat serum (Product #31873) for 15 minutes at room temperature. Cells were probed with a rabbit polyclonal antibody recognizing c-FOS (Product # PA1-830), at a dilution of 1:500 for at least 1 hour at room temperature. Cells were washed with PBS and incubated with DyLight 488 goat-anti-rabbit secondary antibody at a dilution of 1:400 for 30 minutes at room temperature. Nuclei were stained with Hoechst 33342 dye (Product# 62249). Images were taken on a Thermo Scientific ArrayScan at 20X magnification. 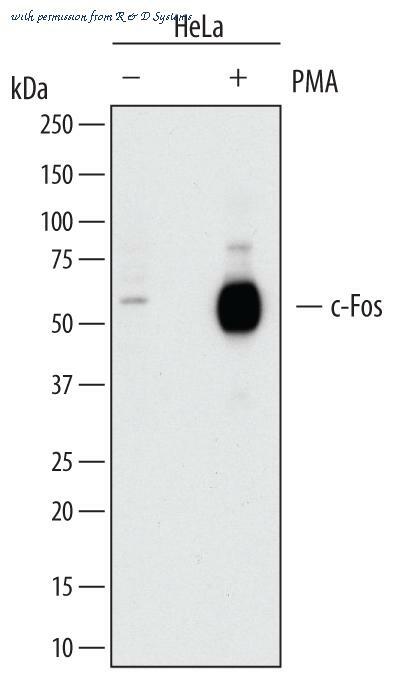 Western blot analysis of c-Fos (Pierce Product # PA1-830) was performed by loading 50ug of Serum (20% Serum, 2hours following 0.25% serum starvation, 36hours) treated HeLa and 293Twhole cell lysate, respectively, onto a 4-20% Tris-HCl polyacrylamide gel. Proteins were transferred to a PVDF membrane and blocked with 5% Milk/TBST for at least 1 hour. Membranes were probed with a rabbit polyclonal antibody recognizing c-Fos at a dilution of 1:500 overnight at 4°C on a rocking platform. Membranes were washed in TBS-0.1%Tween 20 and probed with a goat anti-rabbit-HRP secondary antibody (Pierce Product # 31460) at a dilution of 1:20,000 for at least one hour. Membranes were washed and chemiluminescent detection performed using Pierce Super Signal West Pico (Product #34077). 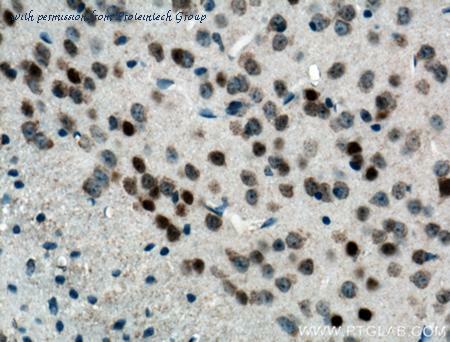 Immunohistochemistry analysis of human hepatoma tissue with phospho c-Fos mAb (34E4). Western blot analysis of control (1) and serum -starved cancer cells treated with 10ng/ml EGF for 5 min (2), 15 min (3), 30 min (4), 1 hr (5), 2 hrs (6), 4 hrs (7) and 8 hrs (9), probed with c -Fos (pSer374) mAb (34E4). Western blot analysis of serum -starved cancer cells A431 (1), A549 (2), SKOV3 (3), OVCAR5 (4), HaCaT (5), PC3 (6), HeLa (7) and HepG2 (8), probed with c-Fos mAb (8B5). 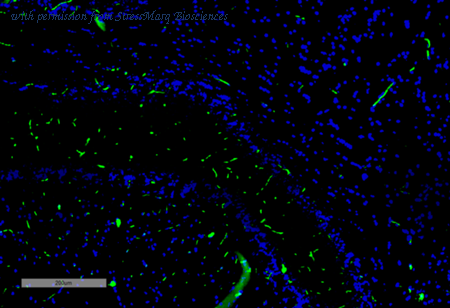 Immunohistochemistry analysis of human hepatoma tissue with c-Fos mAb (8B5). Immunocytochemistry/Immunofluorescence: c-Fos Antibody [NB110-75039] - Rat trigeminal using Rabbit antibody to cFos: whole serum at a 1:500 dilution. 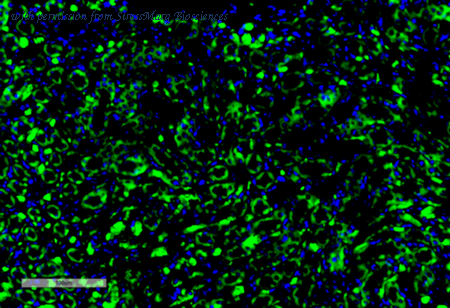 Immunohistochemistry-Paraffin: c-Fos Antibody [NB110-75039] - IHC on rat brain (paraffin section) using Rabbit antibody to cFos (c-fos): whole serum at 1: 300 dilution incubated overnight at 4C and developed with ABC/DAB/Ni. 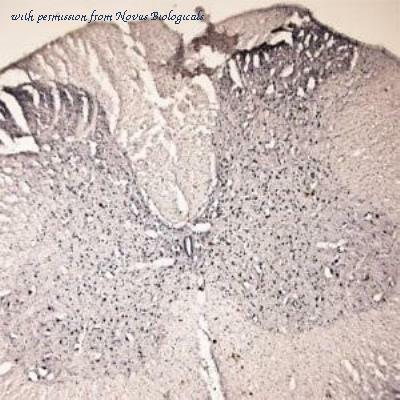 Immunohistochemistry: c-Fos Antibody [NB110-75039] - IHC on rat brain (free floating sections) using Rabbit antibody to cFos (c-fos): whole serum at 1: 300 dilution incubated overnight at 4C and developed with ABC/DAB/Ni. Knockout Validated: c-Fos Antibody (2H2) [NBP2-50037] - Western blot shows lysates of HeLa human cervical epithelial carcinoma parental cell line and c-Fox knockout (KO) HeLa cell line. 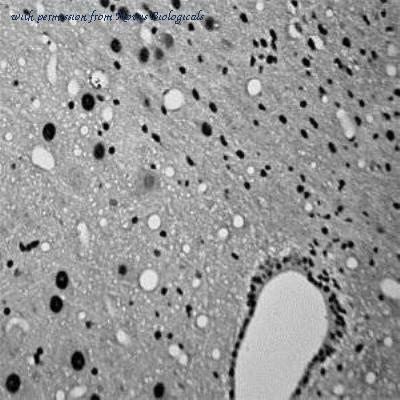 PVDF membrane was probed with 1:1000 of Mouse Anti-Human c-Fox Monoclonal Antibody (Catalog # NBP2-50037) followed by HRP-conjugated Anti-Mouse IgG Secondary Antibody (Catalog #HAF018). Specific band was detected for c-Fox at approximately 52 kDa (as indicated) in the parental HeLa cell line, but is not detectable in the knockout HeLa cell line. This experiment was conducted under reducing conditions. 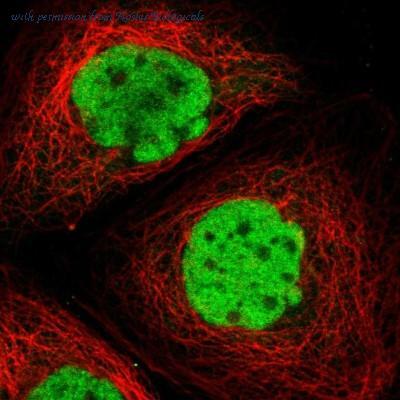 Immunocytochemistry/Immunofluorescence: c-Fos Antibody [NBP1-89065] - Immunofluorescent staining of human cell line A-431 shows localization to nucleoplasm. Antibody staining is shown in green. 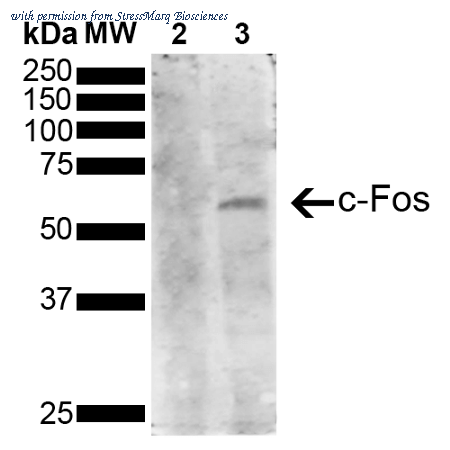 Detection of Human c-Fos by Western Blot. Western blot shows lysates of HeLa human cervical epithelial carcinoma cell line untreated (-) or treated (+) with 200 nM PMA for 4 hours. PVDF membrane was probed with 0.2 ╡g/mL of Sheep Anti-Human c-Fos Antigen Affinity-purified Polyclonal Antibody (Catalog # AF7254) followed by HRP-conjugated Anti-Sheep IgG Secondary Antibody (Catalog # HAF016 ). A specific band was detected for c-Fos at approximately 62 kDa (as indicated). This experiment was conducted under reducing conditions and using Immunoblot Buffer Group 1 . 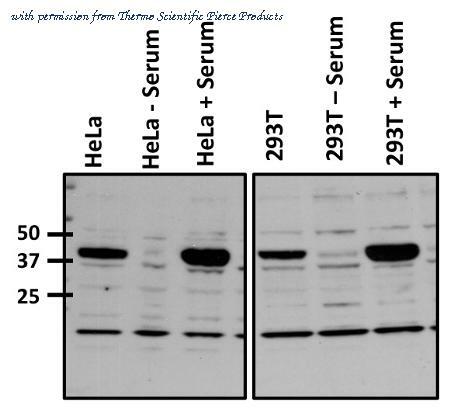 Western Blot analysis of Human Serum starved HeLa cells treated with PMA showing detection of 41 kDa c-fos protein using Mouse Anti-c-fos Monoclonal Antibody, Clone 3G11 (SMC-542). Lane 1: Molecular Weight Ladder (MW). Lane 2: Serum starved HeLa cell lysates. Lane 3: Serum starved HeLa cells treated with PMA (Phorbol 12-myristate 13-acetate). Load: 10 µg. Block: 5% Skim Milk powder in TBST. Primary Antibody: Mouse Anti-c-fos Monoclonal Antibody (SMC-542) at 1:1000 for 2 hours at RT. Secondary Antibody: Goat Anti-Mouse IgG:HRP at 1:3000 for 1 hour at RT. Color Development: ECL solution for 5 min in RT. Predicted/Observed Size: 41 kDa. Other Band(s): 62 kDa. Observed molecular weight of band is higher than predicted 41 kDa band due to post translational modifications. 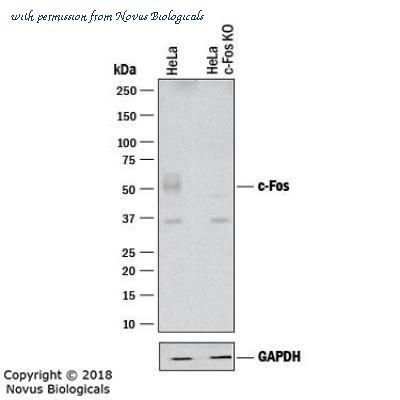 Western Blot analysis of Human Serum starved HeLa cells treated with PMA showing detection of 41 kDa c-fos protein using Mouse Anti-c-fos Monoclonal Antibody, Clone 4A3 (SMC-543). Lane 1: Molecular Weight Ladder (MW). Lane 2: Serum starved HeLa cell lysates. Lane 3: Serum starved HeLa cells treated with PMA (Phorbol 12-myristate 13-acetate). Load: 10 µg. Block: 5% Skim Milk powder in TBST. Primary Antibody: Mouse Anti-c-fos Monoclonal Antibody (SMC-543) at 1:1000 for 2 hours at RT. Secondary Antibody: Goat Anti-Mouse IgG:HRP at 1:3000 for 1 hour at RT. Color Development: ECL solution for 5 min in RT. Predicted/Observed Size: 41 kDa. Other Band(s): 62 kDa. Observed molecular weight of band is higher than predicted 41 kDa band due to post translational modifications. 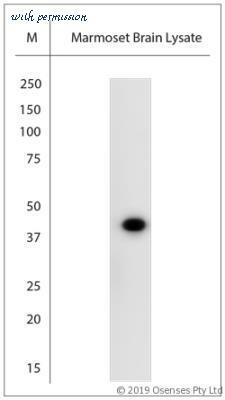 Western Blot analysis of Human Serum starved HeLa cells treated with PMA showing detection of 41 kDa c-fos protein using Mouse Anti-c-fos Monoclonal Antibody, Clone 5B10 (SMC-544). Lane 1: Molecular Weight Ladder (MW). Lane 2: Serum starved HeLa cell lysates. Lane 3: Serum starved HeLa cells treated with PMA (Phorbol 12-myristate 13-acetate). Load: 10 µg. Block: 5% Skim Milk powder in TBST. Primary Antibody: Mouse Anti-c-fos Monoclonal Antibody (SMC-544) at 1:1000 for 2 hours at RT. Secondary Antibody: Goat Anti-Mouse IgG:HRP at 1:3000 for 1 hour at RT. Color Development: ECL solution for 5 min in RT. Predicted/Observed Size: 41 kDa. Other Band(s): 62 kDa. Observed molecular weight of band is higher than predicted 41 kDa band due to post translational modifications.